Today we walk through metal detectors to get into courthouses, airports, and even concert venues. But back in the 1920s the first walk-through metal detectors weren't invented for finding weapons (or nail clippers), they were invented for searching would-be thieves. Primitive handheld metal detectors date back to the 19th century, but it wasn't until the 1920s that two scientists in Germany devised a way to search factory workers for stolen machine parts without having to frisk every employee one by one. Little did they realize that it would be the wave of the future. 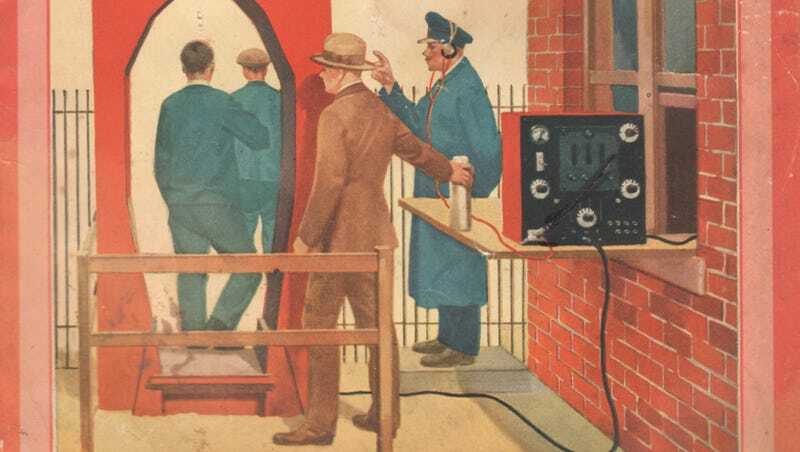 In the mid-1920s, H. Geffchen and H. Richter of Leipzig invented the walk-through metal detector — their "radio detective" — for a large manufacturing plant in Germany. Without any physical contact, their invention made "an effective search of every person leaving the premises" and determined "with certainty, and instantaneously, whether he is carrying with him any object of a metallic nature." No more troublesome pat-downs that waste time and leave room for error. Now your employer-sponsored humiliation can be quick and automatic! The April 1926 issue of Radio News magazine ran an illustration of the device on their cover, which proclaimed, "Radio Oscillator Detects Thieves." The magazine explained that workers were sent through the machine single-file as an attendant wearing headphones looked on, listening for the metal detector to alarm. In the illustration which accompanies this article, the apparatus with the amplifiers which produce the audio-frequency oscillations is shown at the right, standing on the window ledge. The attendant beside it wears the telephone headset, which is connected to the two circuits as described, and notes the change of sound, if any, as each man passes. The degree of sensitiveness to the presence of metal, attained by the use of this apparatus, is astonishing. Even watches and keys can be detected with certainty; in practice the apparatus would be set to an adjustment a little less than critical, so that the smaller bits of metal need not cause signals in the phones. In order to prevent the purpose of the detector being defeated by the presence of lunch cans, thermos flasks, or other property of the workmen, a shelf is provided at the side of the wicket, as shown. The employee leaves any metal articles before passing through the wicket; and then returns to get them, before leaving through the main gate. The article goes on to explain that if the metal detector is set off, the attendant will use a small handheld "searching coil" on the individual to determine if he's hiding something. Pat-downs were promised to become a thing of the past with such futuristic technology! If the detector shows the presence of an undue amount o f metal on a person passing through the gate, he maybe then searched with more care. A small "searching coil" is provided for this purpose, which acts on a similar principle to the larger circuit. By moving this coil over the body of the person searched, the location of any piece of metal is determined accurately in an instant. This auxiliary coil may be made so sensitive that it will respond with certainty not only to coins in the pockets, but also to the presence of a stickpin in the cravat or of metal fillings in the teeth; and that without actually coming in contact with the person thus searched. But this wasn't the first time suspicious employers harnessed the latest technological wizardy to inspect their employees. Back in 1919, a South African diamond mine started using X-rays to search their workers for any diamonds they may have hidden in body cavities or even inside self-inflicted cuts. So I guess the next time you're going through airport security, just let the TSA agents know that while their inspection may seem intrusive to you, it's really no worse than Germany in the 1920s or South Africa in the 1910s. Trust me, it'll go over well.